A black car is travelling along a motorway with a large neon sign ( like a circus or a casino) on the roof endlessly blinking the question and answer NO?FUTURE! At daybreak, it stops in the city centre. Dressed in a military jacket, the woman driving gets out of the car and heads down the main street beating a drum and incessantly ringing the doorbells on people’s houses. The city is still asleep and despite all this racket only a few concerned neighbours peek out at her from their windows. The woman gets back behind the wheel and sets off for another city. In the video, our heroine, Jeanne, resolves to wake up the people in the city, in this case Le Havre. (1) Strolling through the city streets, she beats out a rhythm on a drum and rings people’s doorbells without getting any reply. Before we carried out this action, we had no idea how the neighbours would react. They could have been angry or might just as well have decided to join it. The question we asked ourselves afterwards was whether or not we would have had the same reaction in other cities, such as Naples or Saint Petersburg, for example. The other logical question was whether or not we would get the same reaction at different moments in time. Above all, it hinges on how fast asleep the neighbours are. 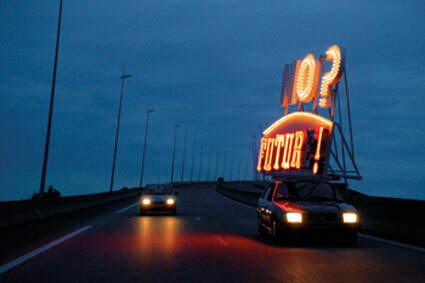 Following the protocol for NO?FUTURE!, every night after the video has been screened the car roams the city streets and lights them up with its sign. During the four months that Manifesta 10 will be in Saint Petersburg, the car will follow each day a different route through the city. There will be 122 different routes in total. These quick, short routes are being planned in collaboration with Dimka Vorobyev and the group V-Kafe from Saint Petersburg. 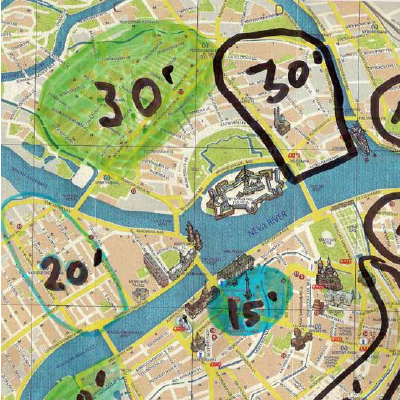 (2) All the routes will be displayed on a large map. The car and its neon sign should act as a mobile collage applied to the city—permanently questioning, free of charge—and as a comment on each individual part, each specific situation. The authorship is apparently anonymous and is highly suspicious. Its role is to spark a dialogue that comes from nowhere at a given moment in time. This collage should act as a firebrand. Now that the car has reached Saint Petersburg, new questions have arisen, such as how it will be perceived in this context and whether or not the English slogan NO?FUTURE! (3) ought to be translated into Russian, without losing the blinking ambiguity that comes from the appearance and disappearance of each of its constituent parts. Advertising slogans in Russia are sometimes left in English (as in other countries), either transcribed into the Cyrillic alphabet or not. I can remember a big sign saying SALE on one of the main streets and BUSINESS CENTRE written in the Cyrillic alphabet. The NO?FUTURE! sign has a touch of a political proclamation, a religious sermon, a fairground pitch or a battle cry about it, but it isn’t actually trying to sell anything—or perhaps it’s trying to settle everything at once. To complement NO?FUTURE! one of the final ideas was to use the title of Nikolay Chernyshevsky’s novel Что делать? [What Is to Be Done?] on the other side. Lenin took this title for his 1902 political pamphlet on organising a political revolution. An exclamation mark could even be added to the end to give Что делать?! [What Is to Be Done?!] However, this title is also the name of a well-known group of artists in Saint Petersburg that has turned down the invitation to take part in Manifesta 10 as they are concerned about the role this event might play in the present political context. In May 1901, though, Lenin wrote another article whose title, (С чего начать?) [Where to Begin?] could definitely be used in a loop to complement NO?FUTURE! in the form of a mirrored question lighting up the outskirts of Saint Petersburg and its more impressive streets, before heading off to another city. Where to Begin? NO?FUTURE! We’ll see. (1) This city in Normandy was flattened by bombs during the Second World War. Out of the ruins, architect Auguste Perret designed a new, austere, modern town built out of reinforced concrete, dominated by straight lines. Historically, Le Havre is a major port that linked France and America and there are several ferry lines to the nearby English coast. Aki Kaurismäki’s 2012 film Le Havre tells one of the stories that take place in the port: a young illegal immigrant from Africa, Idrissa, manages to make it to England thanks to the help of Marcel Marx, who hides him in a shipping container. (2) Dmitry Vorobyev (1974), sociologist, artist, activist. Lives and works in St. Petersburg, in the field of urban sociology and artistic reflection on transformation of urban space. Author of more than 20 publications and co-organizer of a number of exhibitions “100 Beautiful Dead” (2012), “Fragments of an Unknown City” (2011), “Underground Skyscraper” (2007). V-kafe (Sunday Cafe), an informal group of St. Petersburg activists, sociologists, urbanists, local history buffs, and flaneurs that has been conducting walks (mostly to parts of the city usually ignored by tourists and residents alike) almost every Sunday for the past five years. During the walks, the documentation, studies, reflections and sometimes interventions take place before and after drinking coffee on the street on very unconventional points as a traditional culmination of every v-kafe. It made you a moron, a potential H-bomb ! and all the staff at Manifesta for their invaluable support in the form of suggestions and discussions for possible translations. 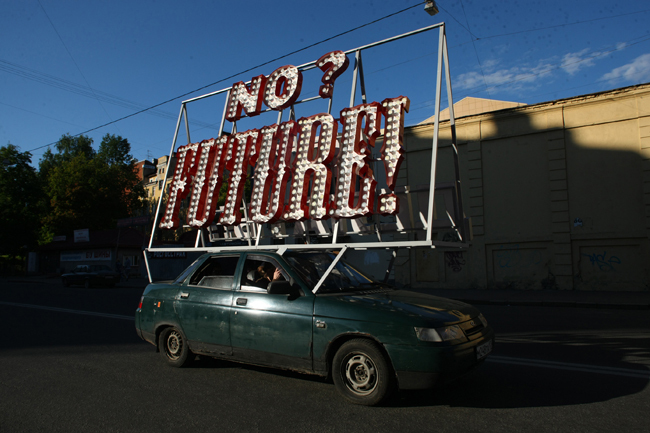 NOFUTURE, 2014, Car with neon sign roaming the city every day at sunset. Production: MANIFESTA 10 / St. Petersburg. HD-CAM. 9’43’’. Production: Spot, Le Havre / arts Le Havre. Galerie Meessen De Clercq, Brussels. Photo: Jordi Colomer, © Jordi Colomer, NOFUTURE c/o Pictoright Amsterdam 2014.